Ever since Tour de France winner Geraint Thomas told the Times that bike helmets should be compulsory (after admitting that he travels in London by taxi and has only raced bikes there) the talk about mandatory bike helmets has been incessant. In the UK 1 in 6 deaths - nearly 90,000 per year - is as a result of physical inactivity-related disease including diabetes, heart disease and cancer. Clearly, any measure proven beyond doubt to reduce peoples likelihood to travel by bike, will almost certainly kill more people than it saves. I have thought that for many who demand mandatory bike helmets, the fact that it reduces the number of cyclists is a feature, not a bug. They want bikes off their roads. They don’t want infrastructure like bike lanes, that would really save lives, taking away driving and parking from them. Whether or not a person on a bike is wearing a helmet is also turning into a “get out of jail free” card for drivers who squish them “he wasn’t wearing a helmet” shifts a bit of the blame from driver of the giant SUV or garbage truck. But let’s be honest and realistic; helmets can save lives. That’s why everyone in construction wears them. That’s why the Finnish safety agency is suggesting that senior citizens wear them. Given road conditions and the quality of the drivers, I wear one when I bike. But it still begs the question we have asked before: we know that more people get traumatic brain injuries in cars than anywhere else. 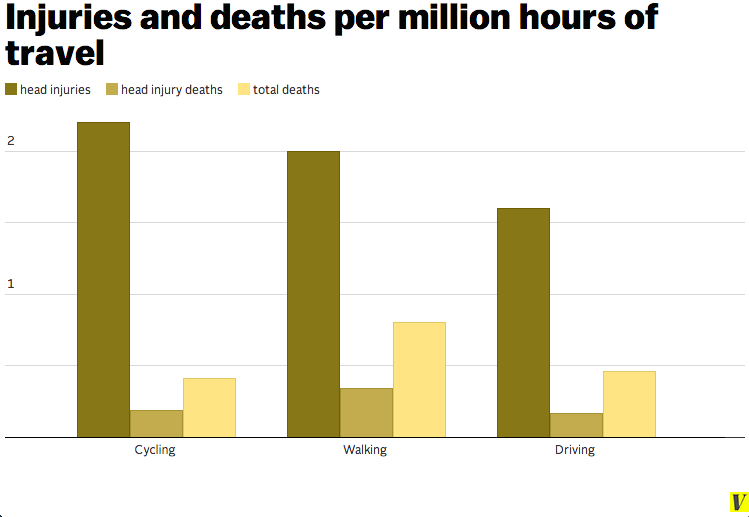 And it is not just because more people drive; we know that the rate of injury and death per million hours traveled is actually higher for drivers than it is for cyclists. So why don’t drivers have to wear helmets? The use of motoring helmets is a “sensible concept,” wrote Davies in 1988. The Davies Craig Motoring Helmet wasn’t for motorsport it was for everyday use. The helmet’s packaging featured families wearing helmets while pooling around town, and a businessman wearing one while being driven by a helmet-wearing chauffeur. Reid wonders why there was never a move to make helmets mandatory for drivers. After all, the logic is identical to that for cyclists; professional racers in both cars and bikes wear helmets, but race car drivers don’t wear fireproof suits and helmets driving around town. It’s a mystery because surely if such helmets saved just one life it would be worth it? Part of the reason for the product’s lack of success could be the widespread belief that motoring isn’t dangerous to car occupants. “Motorists perceived they were safe, strapped in a steel cage,” said Davies. Reid, writing from the UK, asks why this is all ignored. Given that crashing motor cars is the leading cause of death among young men, and that wearing helmets could save lives, isn’t it time the UK Government made motoring helmets compulsory? Personally, I wish there was a really light, good looking and comfortable helmet that older people could wear while walking; falls and head injuries a major issue for them. Showers are a problem too, killing one American every day; unless you have proper safe showering infrastructure (separate shower with non-slip floor and handrails) lives would be saved if there were mandatory shower helmets. But lets start with the most sensible target: Helmets for drivers. If it saves just one life….